In preparation for the 2019 NFL Draft, M!KEDROPSPORTS will be examining previous years’ drafts to laugh, judge, and cry at some of the decisions in hindsight. We start with the 2014 NFL Draft, because the first round players are now eligible for free agency for the first time (unless they were released as many have been. The 2014 NFL Draft isn’t terrible because of the players, it’s terrible because of the horrible decisions made by some teams. Let’s examine some of these terribly wrong decisions. 1. Blake Bortles was the #3 pick overall and the first QB off the board. Bad. Just bad. Although, in defense of the Jaguars, this was certainly not the strongest QB draft. The problem is the fact that Bortles went third overall. First round QBs included Blake Bortles (3), Johnny Manziel (22) and Teddy Bridgewater (32). Bortles is terrible. Manziel hasn’t played since 2015. He last two years, 15 starts, and just 258 passes. Due to a devastating injury, Bridgewater has started just 29 games in his career and one since 2015 (week 17 with Saints this year in a throwaway game). Since returning from his 2016 knee injury mid-way through 2017, he has thrown just 25 total passes. The next two QBs came off the board in the second round – Derek Carr and Jimmy Garappolo. Carr has spent his entire career with the Raiders and was given a $100+ million extension two years ago. Carr has a 32-46 career record. Garappolo was traded to the 49ers in 2017 for a second round pick after four years as Tom Brady’s backup. He received a mega-contract last off-season and is recovering from a torn ACL. There are no other “notable” QBs. Tom Savage (LOL), Zach Mettenberger and Garrett Gilbert (who are both currently in the AAF) and AJ McCarron (keeps bouncing around as backup). 2. Eric Ebron was drafted #10 overall. Okay, that’s fine right? Well, he scored 14 touchdowns in 2018 with the Colts, after being let go by the Lions after 2017. He scored 11 TDs in his four years with the Lions. That’s a tough look for the Lions. This genuinely seemed like an okay idea at the time, Buffalo was in desperate need of playmakers. But looking back – Mike Evans went 7th, Odell Beckham went 12th, Brandin Cooks 20th, Davante Adams went 53rd, Allen Robinson 61st, Jarvis Landry went 63rd. First round picks are guaranteed four year deals, with a 5th year option. 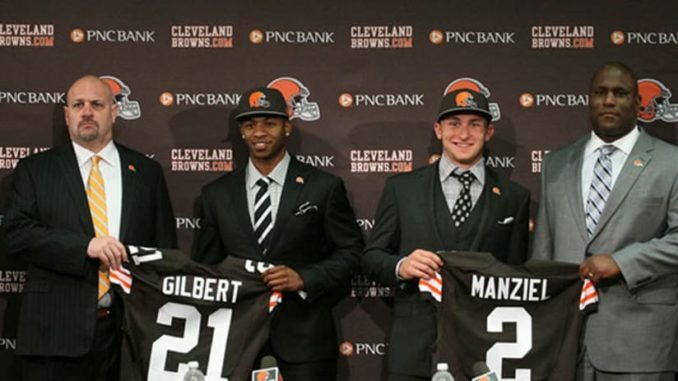 Browns had two first round picks – they took Justin Gilbert (mentioned above) 8th overall and Johnny Manziel 22nd. Both are currently out of football, just five years removed from this draft. And neither stayed with the team past 2015. Gilbert played 23 out of a possible 32 games in two years, starting just three of them. He had just one interception. Manziel made 8 starts in 2 two years, going 2-6. throwing 7 TDs and 7 INTs, completing just 57% of his 258 passes. It’s also worth noting that they only had the 8th pick because they traded down with the Bills. Buffalo took Sammy Watkins at 4. Khalil Mack went 5 and Mike Evans went 7. Browns could have used either of them. And of course, Aaron Donald was available when they got to 8. Fourth round pick, CB Pierre Dessir was released in training camp before 2016. At the conclusion of the 2018 season with the Colts, Dessir was ranked as the 18th best overall grade among all qualifying cornerbacks in 2018 by Pro Football Focus. Ironically, one guy has worked out for the Browns – #2 pick Greg Robinson started 8 games (played all 16) for the Browns in 2018 and recently signed a one year extension to remain with Cleveland in 2019. This certainly seemed like a good idea at the time. And wasn’t a bad pick. Clowney has racked up 29 sacks through 5 seasons. Not terrible, considering he only played 4 games as a rookie and missed some time in 2015. What makes it terrible is that Khalil Mack, the 5th pick, has 53 sacks through 5 years and Aaron Donald, the 13th pick, has 59.5 sacks. Both are widely considered among the top players at their position while Clowney is a good player, who has made an impact, but certainly isn’t on the level of those two.